Say THANK YOU in a very special way with this gift of cookie perfection. This special golden gift tin is filled with 16 classic Oreo® cookies hand-dipped in Belgian white, dark or milk chocolate. Some are drizzled with Belgian white chocolate, some are drizzled with Belgian dark chocolate, others are sprinkled with milk chocolate decorettes—all are amazingly scrumptious. 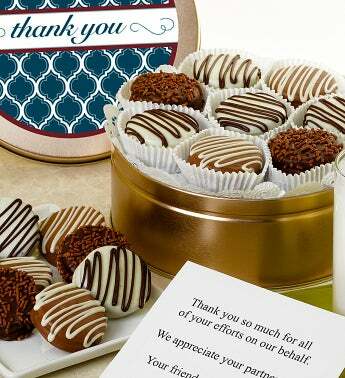 Inside send a personalized message of thanks to make the gift sweetly complete. 16 Cookies. Say THANK YOU in a very special way with this gift of scrumptious cookie perfection. This special golden Thank You gift tin is filled with 16 classic Oreo® cookies hand-dipped in Belgian white, dark or milk chocolate. Inside send a personalized message of thanks to show how much they are truly appreciated! Please note that the personalized message comes from the card message you enter towards the end of the checkout.